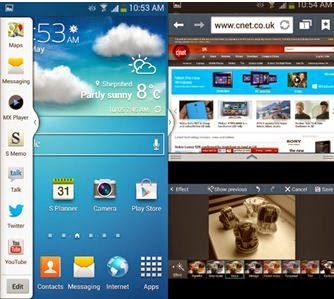 Samsung smartphones running Jelly Bean 4.1 and later OS version, including the Galaxy Grand generally come with Multi Window -- a unique feature that allows users to work on multiple tasks on one screen easily. With Multi-Window feature, you will be able to take Notes while watching a video or search the Internet and check SMS messages at the same time. This guide will walk you through activating and using Multi-window feature to perform multiple tasks simultaneously on the Galaxy Grand. Follow these steps to enable and use multi-window on your Galaxy Grand and multitask with it. 1. Tap on Apps from the Home screen. 2. Next, tap on Settings. 3. Tap on My Device tab. 4. Scroll to and tap on Home screen mode under My Device. 5. From the Home screen mode screen, tap on Standard mode. You will then be prompted with the Enable Standard Mode message. Read the information and then tap OK to continue. 6. Now tap on Apply to apply the selected mode. 7. Tap on Display from My Device Personalization options. 8. Scroll to a nd tap to check the box next to Multi Window. Doing so will enable the feature, allowing you to multitask by using two or more apps at the same time. 9. Tap and drag the application you want to view or use in multi window. You should then see the applications running in Multi window. You may now start using any of the apps you preferred simultaneously on your Galaxy Grand. 1. Tap the handle to open or close the tray. 2. To move the tray, tap and hold the handle when the tray is open. 3. To change the tray's position, tap and hold the handle when the tray is closed. Now get to know more of the Multi-Window feature by exploring the interface and available tools. And that should do it!